President Dmitriy Medvedev and Defense Minister Serdyukov met at the Vystrel training area near Moscow yesterday. Medvedev set his priorities for 2010–nuclear forces, rearmament, and military housing. On force modernization issues, Medvedev emphasized this year’s priority on preserving the strategic nuclear component. Looking over infantry weapons, he said he wants Russia to create modern, effective, and economical small arms. They should be competitive with the best foreign models, he added. He inspected some new wheeled vehicles and armored vehicles from KamAZ, and looked over the Tigr vehicle which will go to special operations sub-units. He was told it was not adopted widely in the armed forces because it has a powerful American-made engine. Serdyukov said a similar Russian engine is being developed. Serdyukov reported that ineffective repair work was cut by 28-30 percent this year. The Defense Ministry also significantly cut ineffective RDT&E, and savings from both were put toward buying new arms, according to Serdyukov. He asserted that, in line with Medvedev’s direction, financing for the 2010 GOZ is beginning earlier than in the past, as early as 15 January. Serdyukov said Russia bought 43 new aircraft in 2009, against only 2 in 2008, and 1 in 2007. It also got 41 helicopters, against 10 in 2008, and 2 in 2007. 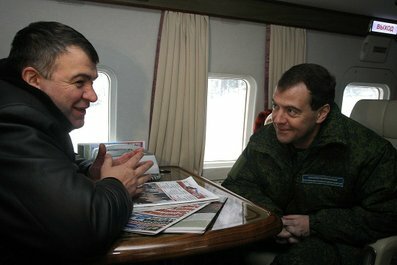 Serdyukov assured Medvedev that all servicemen in line would receive apartments this year. Medvedev responded that, “No weapon will be as important in comparison with meeting the promise we gave officers to supply them with apartments.” Serdyukov reported that the Defense Ministry met its housing target for 2009 by obtaining 45,614 apartments. This entry was posted in Force Modernization, Military Housing. Bookmark the permalink.